The Plustek OpticFilm 8200i Ai is the successor of the OpticFilm 7600i Ai. Both devices have the same hardware; they donly iffer in the software version: In the scope of delivery of the Plustek OpticFilm 8200i there is SilverFast Ai Studio in the new version 8 included. The version 8 distinguishes itself mainly by a new graphical user interface compared to the old version 6, so that the training and use is much simpler. The Der Plustek OpticFilm 8200i has an optical resolution of 7200 dpi. As you can read in our Review, the effective resolution is only 3250 dpi, i.e. not even 50% of the nominal resolution. In order to get scans with 3250 dpi effective resolution one has to scan with the maximum resolution of 7200 dpi. Such scans need a lot of time (about 15 minutes depending of the settings) and are very bloated: One gets image files with 210 Megabyte, however, only 40 Megabyte contain real image information. The other 170 Megabyte contain double pixels and have to be removed in a time consuming image editing process after scanning. You can insert 4 mounted slides in the slide mount holder, or you can insert up to 6 pictures in the film strip holder, either on film strips or singular. The scanner, however, does not have an automatic film holder transport; that means that you have to move the film holder forth by one position after each scan in order to scan the next picture. If you order a second film holder you can fill it carefully while the other is still inside the scanner. 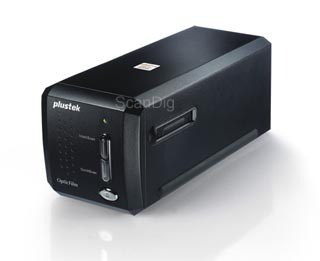 The Plustek OpticFilm 8200i is a very slow scanner. On average you can make 4 scans per hour if you use the automatic dust and scratch removal and the multi-exposure feature. That's why the device is less suitable for archiving a complete collection of films but more in order scan a couple of slides or negatives occasionally. Additionally, there is the time consuming post process in Photoshop®, in order to compress the bloated image files. In practice you have to rework each scan of the Plustek OpticFilm 8200i, so that we recommend to buy the scanner with Photoshop® Elements by all means, if you don't have a good image editing program on your computer. For more information, please, read our test report about the Plustek OpticFilm 8200i.